Damon Albarn and Jamie Hewlett are back in action, collaborating with James Murphy and Andre 3000 and designing shoes for Converse. 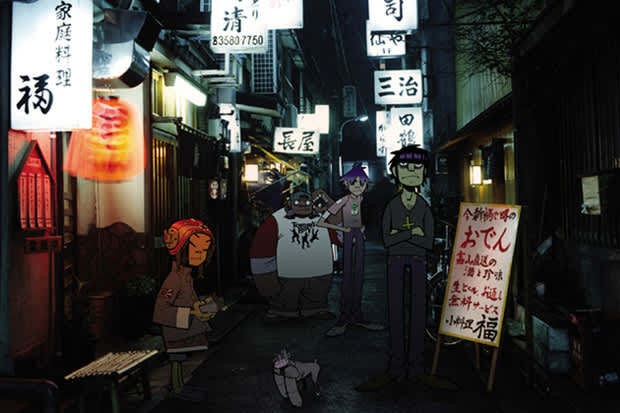 Below, read our profile on their Gorillaz project, from 2001's Summer Music issue, FADER #8. Damon Albarn and Jamie Hewlett are talking about soul, or rather they’re talking about soullessness. Albarn and Hewlett—Blur frontman and the creator of Tank Girl respectively and themselves both tabloid-fodder—grew bored of the pop scene and of celebrity culture in general, and decided it was time to cast around for a new outlet. So they did what all good jaded west London white boys do when in need of kicks—they adopted black music. So Gorillaz was conceived, a “band” composed of characters drawn by Hewlett with Albarn at the helm of a team of musical collaborators which includes Cibo Matto frontwoman Miho Hatori, journeyman beatmaker Dan the Automator, veteran Cuban idol Ibrahim Ferrer, Augustus Pablo’s rhythm section and many more. While Hewlett’s characters seem little more than a gimmick (this band doesn’t actually take its anonymity that seriously—certainly they are no Daft Punk in that respect), the collaborations are effective.